I wanted to share with you today something that David and I have started this year. I don’t know about you, but David and I are big greeting card people. 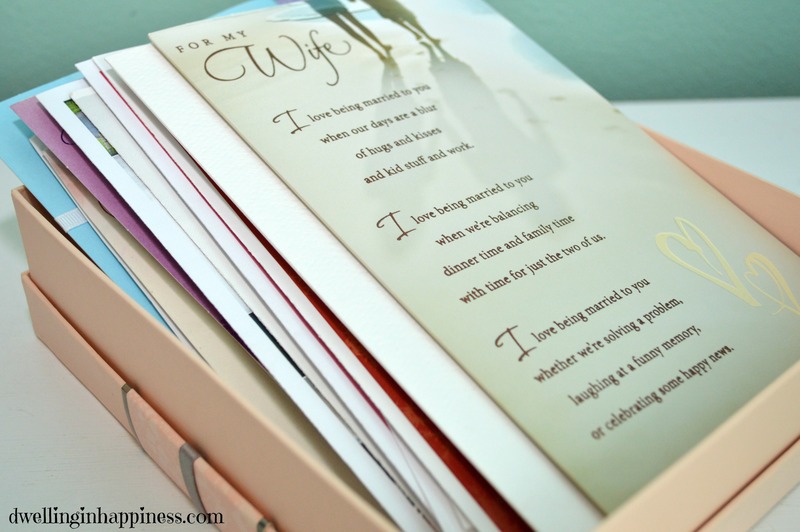 For holidays, birthday, anniversaries, etc, we like to buy cards for each other and write special meaningful notes inside. However, if you haven’t noticed, cards are expensive!! For pretty decorated ones, they are upwards of $4 or $5! Seriously, for a piece of cardstock with words someone else came up with. Just think of how much that is when added up for all the special occasions each year. Plus, for us, greeting cards make it too easy to just sign your name and be done. They have nice poems and such inside, making it much easier to not have to share your heart to another. Not really as special, wouldn’t you say? We like to be more personal with our cards and what we write inside, so at first, we decided to start making our own cards for each other. David is a wiz at Photoshot, so he would make me the most amazing cards that were completely personalized. That was SO much more meaningful to me than a store bought card! Because we are so sentimental, we both have saved ALL the cards we’ve ever given each other. That’s 5 years worth of cards! I love to go back sometimes and read the ones he gave me when we first started dating. It’s so special to see our love for each other evolve and grow over the years. But, I’m running out of room to put them, and I can’t imagine having to store another 5, 10, 15+ years worth plus any cards from our kiddos! Also, I have no idea how to use Photoshop, and my “handmade” cards weren’t as great (because how do you really make a manly card?!) so we then took it one step further. 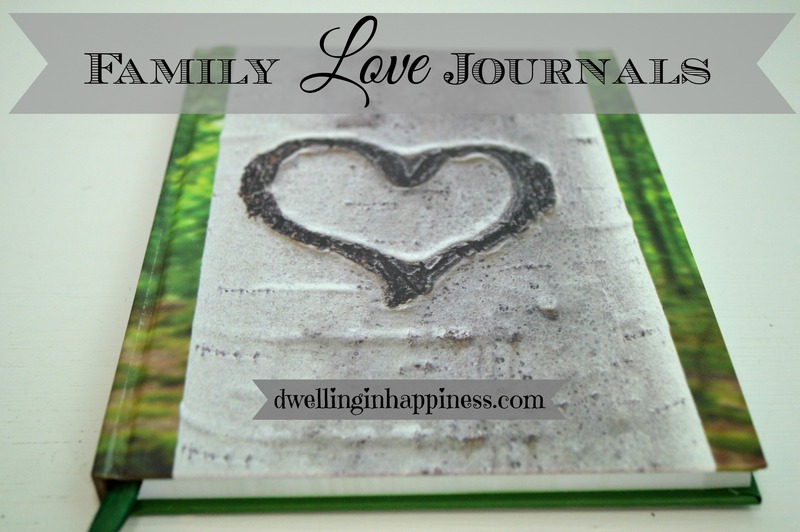 We came up with the idea of having a “family love journal” for each other, where on each special occasion, we’d take each others and share our hearts and feelings. 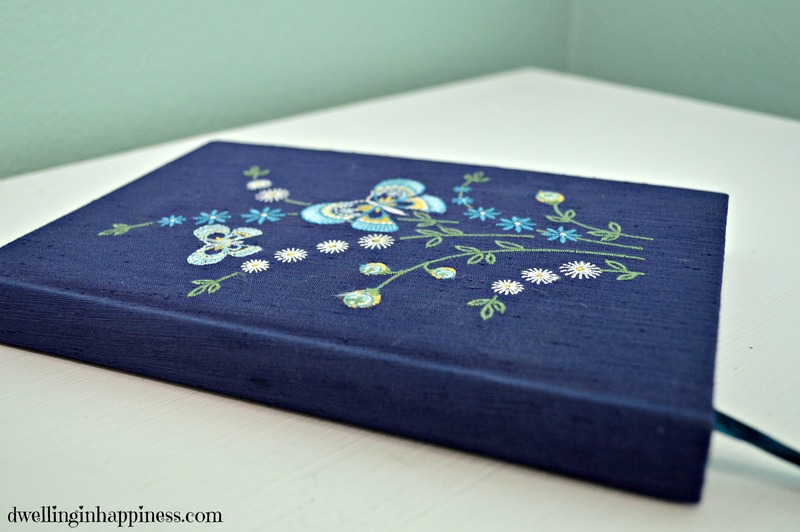 I bought a journal for him, and he picked a beautiful one out for me. Not only are we writing in them for each other, but we are also going to have Jade and any future kiddos write in them their own special notes as well, for our birthdays and special occasions. What’s so great about having a journal is that each and every special little personal note is in ONE place to stay. There are no loose pages! 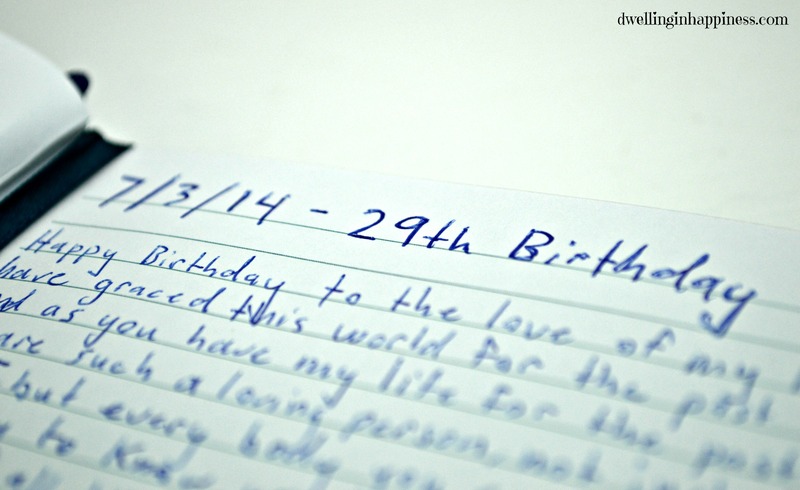 You can look back throughout your journal at any time, and cherish those written sentiments from your loved ones. I can’t wait for Jade to be able to contribute and share a little scribble or stick drawing! I’d much rather have that than a card David quickly picked out and put Jade’s name on. Father’s Day this year was fun because it was David’s first with Jade being here (last Father’s day I was still pregnant!). So, I found this adorable poem and got Jade’s footprint for her daddy’s journal. He loved it! Jade will be 1 in November, and we also are going to buy her a journal and start writing in it every year for her birthday and special occasions as well. As she gets older, she will have a special place of notes from David and I that she can read and look at whenever she wants to remember just how loved she is. What a cool keepsake to have for when she gets older and has kids of her own! Yikes, that means I’ll be older too. 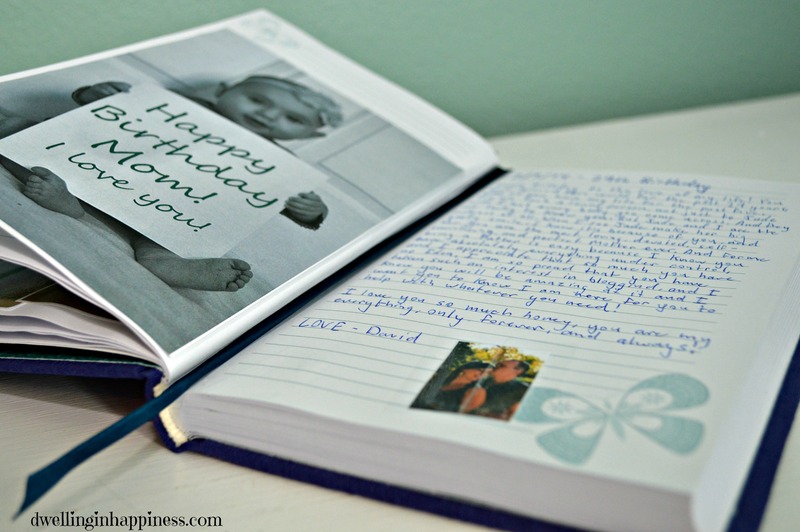 Do you have any special family journal or tradition for holidays and special occasions? I’d love to hear what you do! 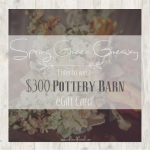 Spring Green Pottery Barn Giveaway! I love this idea! The journal is such a meaningful and wonderful place to write loving notes and to read and feel so happy and loved. Thank you for sharing such a great idea! I am so going to do this! We have 12 years worth of cards (and we LOVE going back to read them!!) but yes, the price of a card gets me too!! 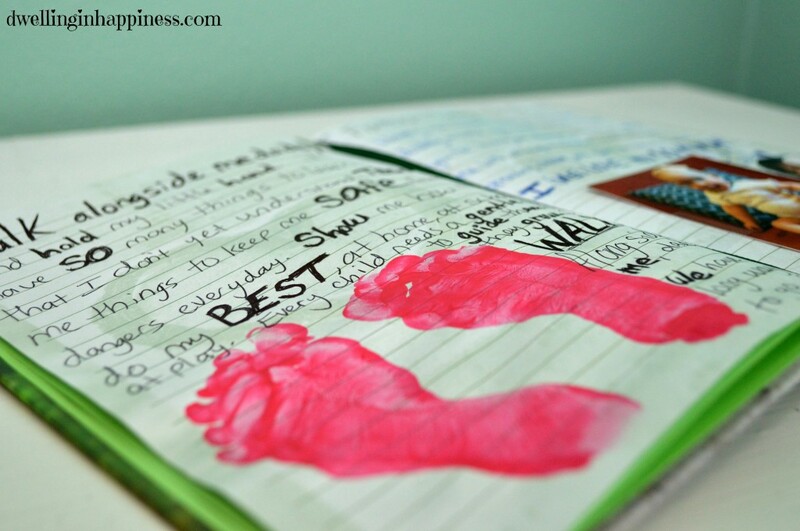 I love, love this idea Amanda and am going to put journals on my list!! Thanks off sharing this sweet idea! I started this with Matt this year based on your suggestion, and I love it! And you are so right, the messages are so much more heartfelt when you don’t rely on a store bought card. Thank you so much for sharing! Aw, thanks Sam!! Isn’t it fun to go back and read what he wrote to you? Especially if it’s a rough day, I think reading how loved we are always helps us feel better. 🙂 So glad you guys are doing it, too! I love the idea, it must be great to look through all of those memories. My husband and I have a journal that we write poems, song lyrics or other sayings we come across that reminds us of each other, our love. I also have one I write in for my kids with sayings, book quotes or songs with words I want them to ave from me for now, love, in the future. My husband is not great with words himself so he is able to convey how he feels through using other peoples words. It has been really special for us. Emily recently posted…how small is too small? 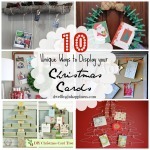 This is a fantastic idea as I have recently started getting rid of cards. After 24 years of marriage and our oldest is 22, I don’t need to keep anymore paper! I am nominating you as a Featured Blogger in this week’s #WWDParty. This is such a wonderful idea! 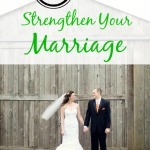 You two have created a tradition, keepsake and even a tool to strengthen your relationship. This is amazing and it’s great that you’ll start one for Jade soon. Thank you for sharing this at the Thank Goodness It’s Thursday party, Amanda. 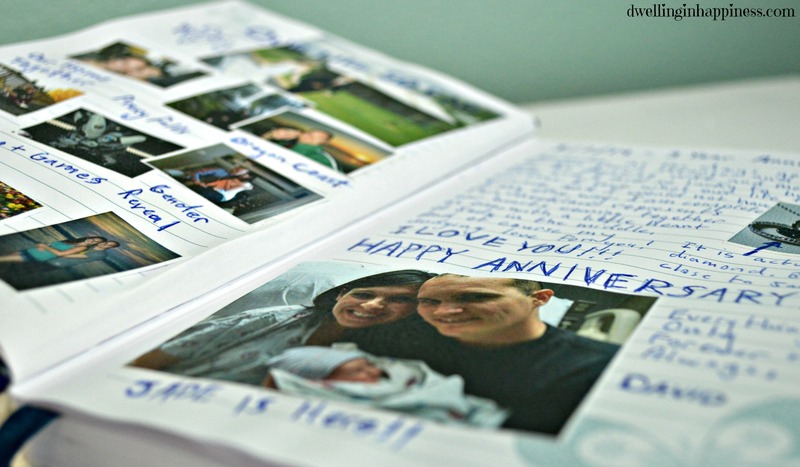 I love the idea of a family journal! I am sentimental like you and save all the cards and notes that people give me. I would definitely do this! 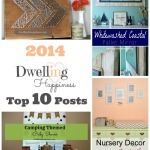 Thanks for sharing with Hump Day Happenings. I just LOVE this!! Our anniversary is coming up next week and this sounds like just the perfect gift! We both are note writers and I love being able to keep something like this for years and years and years to look back on. I wanted to stop by and let you know though that I nominated you for a Liebster award over on my blog this morning. You can check it out here: http://www.burlapandbabies.com/2014/08/liebster-award-nomination.html. Have a great week! Thank you, Amanda!! Yes, I’m so excited to keep doing this and then having special memories years down the road to look back on and read! Happy early Anniversary! And yay, thank you for the nomination!! I’ll get on writing that post. 🙂 Have a great Thursday! I too am a card loving gal, but I have to agree all the beautiful cards are so expensive…I still go that route though because I just love getting something in the mail box other than bills. BUT, I have to say your idea is ingenious! 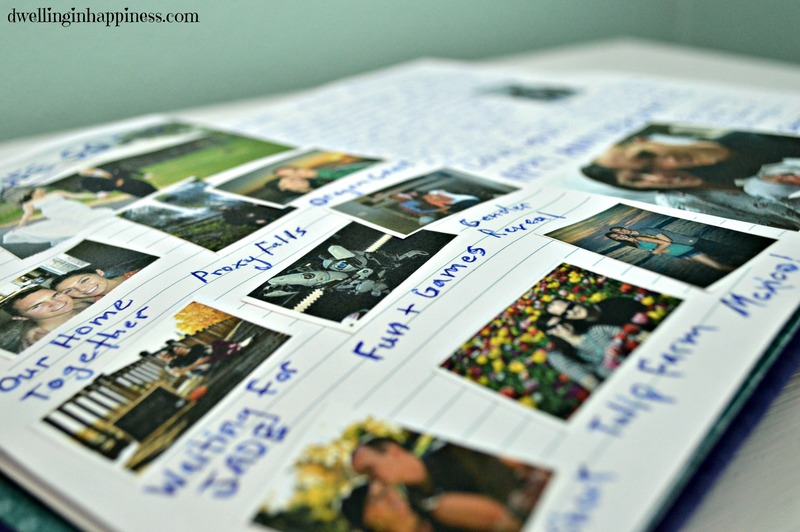 Wondering if you would be open to me featuring your idea/photos on my blog as I think my readers would love this idea. Lovely to meet you. I planned to make these amazing birthday cards for my twins first birthdays and then time went away from me and the night before I had nothing – so I grabbed two journals and wrote them each a letter. My plan is to do that on every birthday and occasion now instead of getting them a card. 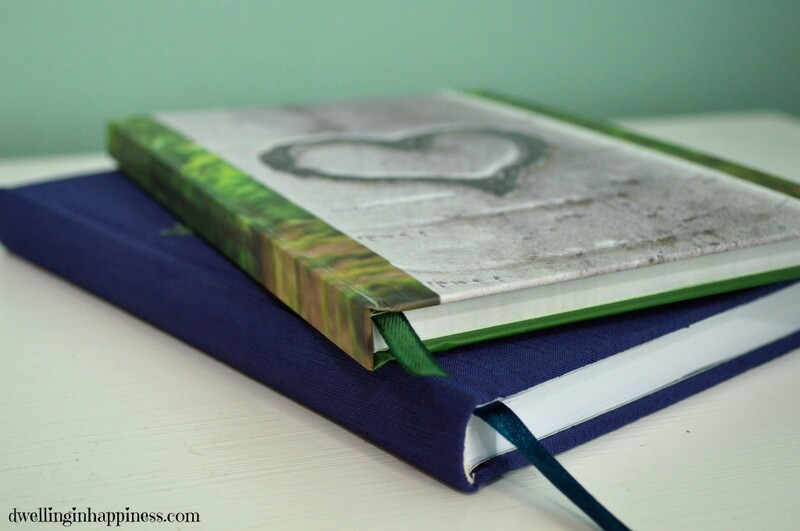 Thank you so much for sharing your journals, I love how you have added photos and might try that too. What a great idea! My husband and I had a journal that we sent back and forth to each other while we were living apart. 🙂 This reminded me of that. This is a project I’m sure you’ll appreciate and enjoy for ages!! Thanks for stopping by Creative Spark! Thank you! Yes please, steal away! 🙂 Thanks for visiting today! This is a fantastic idea. My fourth grader is having a birthday soon. I think we’ll start this tradition with her. Thank you so much for this idea and post. This is SO beautiful!!! I love this idea! We have envelopes on our doors that we leave little love notes in for each other, but it gets cluttered and looks crazy sometimes! 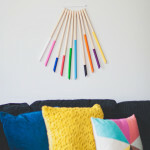 🙂 This is a wonderful craft that could replace the post-it doors! 🙂 Thank you! My husband and I have two children who are now 15 and 17 years old and we have four love journals that we have been writing in since they were three years old. I had the EXACT same experience you described in your blog. I hated spending money on cards and then was frustrated trying to save the cards. I bought four journals for your family and called them our “love journals”. 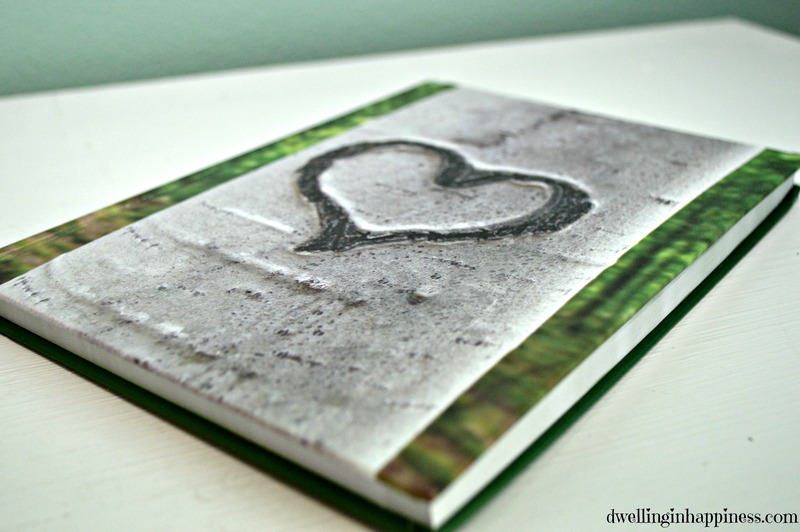 Every birthday, holiday, special occasion, the love journals will be on our dining room table and everyone will have written in the journals. Now, as my daughter prepares to head off to college, she has 15 years worth of love notes in her journal to take with her! And he has given us this command: Anyone who loves God must also love their brother and sister.